Cannoli in ice cream form equals the greatest dessert ever! This has really got to be one of my new favorite desserts. It must be, I definitely had an extremely hard time not eating the entire batch. I kept going back for more. I had some before dinner, then a generous scoop after dinner. Woke up this morning and couldn’t resist a taste for breakfast, a small snack size worth at lunch then a generous scoop after dinner – then I went to scoop out any remainder that was left along the edges of the container (am I admitting this??). Yes, this recipe is a dangerous thing for me. I usually have much more self control than that. I’m obsessed with cannoli and even more obsessed with ice cream (and gelato) so this is pure dessert bliss to me. I took this ice cream pretty seriously. I fried up a small batch of cannoli shells to break up and add to this because I wanted this to be the real deal. I’ll tell you that is optional but I’d highly recommend adding them in, they make it taste just like a cannoli when you lick through the ricotta ice cream and bite into one of the many crisp, cinnamon cannoli shell pieces. 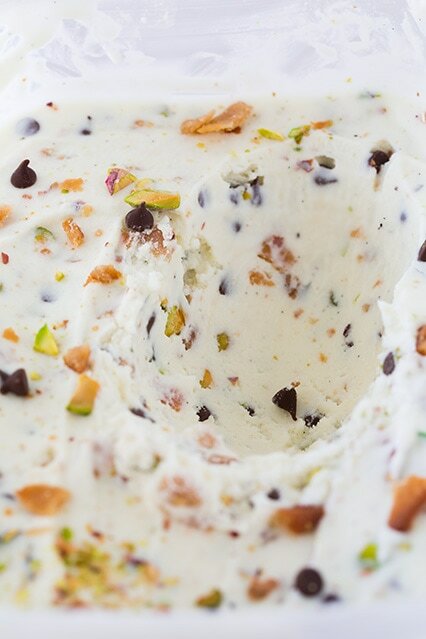 Please add this cannoli ice cream to your to be made list and make it soon. You’ll fall completely in love and feel as though you were in Italy. Just don’t come back to blame when when you can’t stop eating it and begin to crave it all the time :). Now I just need to make this in chocolate form too. Enjoy! 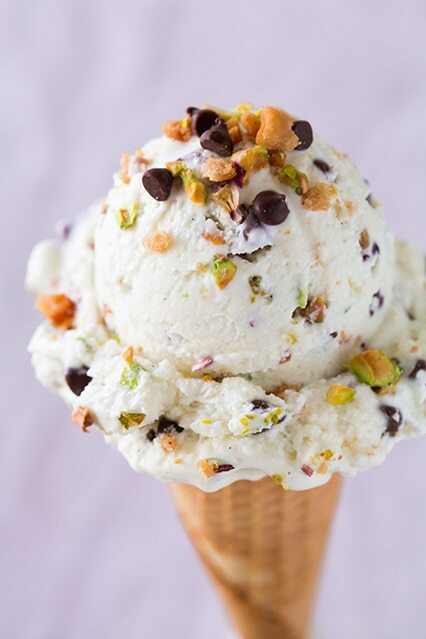 One of the best ice cream recipes out there - you get two tempting desserts in one. 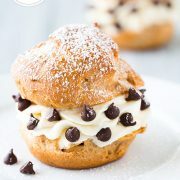 Cannoli meets ice cream and seriously delicious! In a blender combine heavy cream, milk, sugar and corn syrup and blend mixture on low speed until sugar has dissolved, about 1 minute. 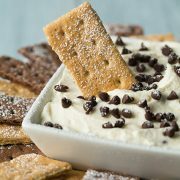 Add in ricotta, cream cheese and vanilla bean seeds and blend mixture until well pureed. Transfer to an airtight container and freeze 1 hour, stirring once halfway through freezing, then transfer to an ice cream maker and process according to manufactures directions. Add in cannoli shell pieces, mini chocolate chips and unsalted pistachios during last few minutes of processing. Transfer to airtight container and freeze until semi-firm (I found this was best slightly soft so if you do freeze until firm allow it to rest at room temperature for a bit before enjoying). 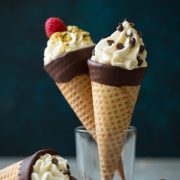 *I used half of this recipe here except I cut them into 4-inch rounds fried them in vegetable oil (rather than baking in muffin tins), then drained on paper towels, broke them into small pieces and chilled them in the freezer before adding to the ice cream. 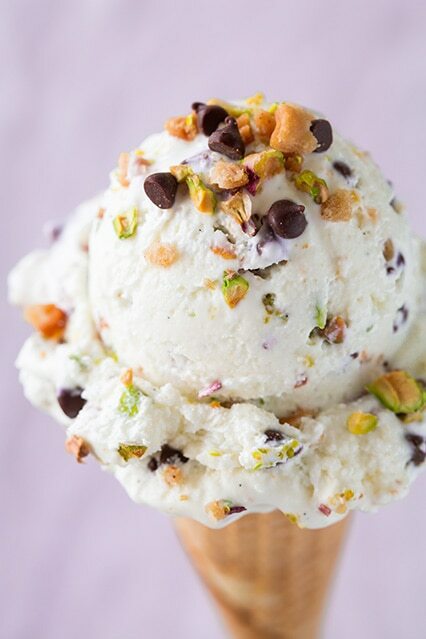 **If you don't want you ice cream as "loaded" as mine you can cut back on the amount of chocolate chips and pistachios. kontol: First off I would like to say awesome blog! I had a quick question which I’d like to ask if you do not mind.